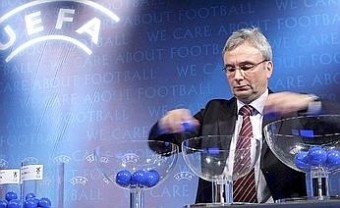 Yesterday, UEFA revealed the draw seedings for Euro 2008′s final tournament. The 16 qualified teams have been separated into 4 different pots, which will be utilized to determine the 4 groups of the tournament by drawing one team from each pot. With the two co-host nations (Austria/Switzerland) already occupying positions A1 and B1 in the draw, Pot 1 will be formed by European champions Greece, and the team with the highest UEFA coefficient from the 2006 World Cup and Euro 2008 qualifying, in this case the Netherlands. The remaining pots have been filled in order of coefficient. The teams in Pot 2 will be Croatia, world champions Italy, the Czech Republic and Sweden, while Romania, Germany, Portugal and Spain will occupy Pot 3. Finally, Pot 4 contains Euro championship newcomers Poland, as well as France, Turkey and Russia. UEFA’s seedings give rise to interesting scenarios. Namely a “group of death” could potentially contain Netherlands, Italy, Germany, and France, while a “relatively easy” group could include Austria, Croatia, Romania, and Poland. “The system is based on the results of the qualifying competitions – a cycle of two competitions, that is to say one EURO qualifying competition and one World Cup qualifying competition“, explained UEFA’s professional football director Giorgio Marchetti. “The coefficients are drawn up by dividing the total number of points earned by each team during the two qualifying competitions by the number of matches played. From this point of view, the system is simple, transparent and objective, there is no interference. In the case that teams have the same coefficient over the two qualifying competitions –which is the case for Romania and Germany, and Turkey and Russia– we apply the coefficient over the last competition (note: Euro 2004), the average goal difference of the last competition, the average number of goals scored, average number of away goals scored and finally, if everything is still equal, we would draw lots” concluded Marchetti. UEFA’s football director added that “the UEFA ranking has been constantly and consistently applied in this way over the past few editions of the European Championship, but noted that a UEFA review of its coefficient ranking system is under way, for future Euro competitions. On an added note, in an interview to La Stampa UEFA president Michel Platini commented on Raymond Domenech’s recent declarations to the press, in which the French coach had defined the fact Italy are not seeded in the top pot as “astonishing”. 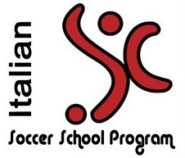 The ex-Juventus legend said that “it’s right this way“, highlighting the criteria of seeding selection (namely that Pot 1 is composed of the two co-host nations Austria/Switzerland, European champions Greece, and the team with the highest UEFA coefficient from the qualifying). “Only you and Domenech find this method ridiculous. Besides, these criteria were already here before I even took the UEFA president job, so deal with it“. To be perfectly honest, I personally find it a good thing the Azzurri aren’t seeded in the top pot. Being guaranteed to avoid Austria, Switzerland and Greece doesn’t sound like such a good deal to me, so I don’t know what the Italian press is complaining about. The draw will take place on December 2 at 12:00pm local time, in Lucerne, Switzerland. This entry was posted on Friday, November 23rd, 2007 at 4:59 am	and is filed under Azzurri, Euro 2008. You can follow any responses to this entry through the RSS 2.0 feed. Both comments and pings are currently closed. A few years ago, Dan Leo introduced me to the World Football Elo Ratings. Originally, they were developed to rate world class chess players by Dr. Arpad Elo, but in 1997, Bob Runyan converted the system to cover world football. What I like about this system, as compared to FIFA or UEFA, is that rankings are continuously updated after each international game. They also provide a wealth of historical data about your favorite national team. For example, you can see that Italy played France in their first international in 1910, England played Scotland in 1872, and the USA played Canada in 1885, respectively. In this system, England is presently ranked 9th, Ireland is 32nd, Northern Ireland is 67th, Scotland is 33rd, and Wales is 56th, respectively. The Group of Death that you have mentioned would probably be the best Group of Death ever .. This doesn’t even include numerous appearances in the tournament finals .. so that’s 8 World Cup Titles & 7 European Championships between those four teams .. wow !!! The Group of Death does sound fun. My issue is that since the TWO host nations, and the holders are in Pot 1, that is now one of, if not the weakest pot, defying the point of the whole thing. Sure, put the hosts in the competition, but should they really be put into the highest ranked pot, spreading the other good teams between pots. Would the potential ‘Group of Death’ have been possible if ALL the teams had been sorted according to their UEFA coefficient? You make quite a good point, tomsharp. The Netherlands, by being in Pot 1, are guaranteed to avoid Austria, Switzerland and Greece. Not exactly the best of deals if you ask me. So in this scenario, the closest we can get to a “group of death” would be Italy (or Netherlands), Germany, France (or Spain), and Russia/Turkey. Much more balanced. Here, the best “group of death” would see Italy (or France, or Spain, or Netherlands… only top teams in pot 1), Germany, Portugal, Sweden. Even more balanced. We mustn’t forget however that the reason UEFA are using the UEFA coefficient is to reward a team’s performance during the last qualifying campaign. In other words, a “big football nation” might be ranked lower simply because they have underperformed, despite they have the talent potential to be a tournament winner (like Germany, Portugal, Spain and France, who ended up in the lower two pots). Steve, Austria is playing at home. Let’s move them all the way up to the 59th. PS. FIFA’s rankings have as much reality as the Fed’s inflation data or the official Soviet military casualty reports. Marco, you going to Austria / Switzerland next summer? Steve, what about you? I very much doubt it Ahmed although I’d love to. Imagine that I used to live in France at some point, and the World Cup swung by in 1998 when I was 16 years old. Not rich enough to afford any tickets (it doesn’t help when your parents, especially your father, doesn’t give a crap about football). If you ask me, I think there will be 2 groups of death..
Can’t wait to see them in Africa..!